Dr. Luis Herrán Ávila joined the Department of History at UNM in 2018. A historian of the Cold War in Latin America, his research emphasizes conservative, anticommunist, and extreme right movements. 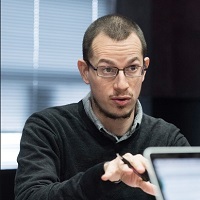 After researching the comparative history of anticommunism in Mexico, Argentina, and Colombia, his current book project seeks to unveil the national and Latin American dimensions of right-wing activism in Cold War Mexico. The book project examines the history and Cold War transformations of right-wing dissidence to the Mexican postrevolutionary state, and situates Mexico as a crucial hub for transnational anticommunist activism, shedding light on the various ways in which Mexican anticommunists forged links with Latin American, European, and East Asian fellow travelers. Herrán Ávila’s publications in both English and Spanish reflect a range of related research interests, such as right-wing youth; neofascism in Latin America; the history of political crime in the Americas; and the intersections between banditry and insurgency. He has also been a recipient of various scholarships and grants from Fulbright, Mexico’s National Council for Science and Technology, the New School for Social Research, and the Hoover Institution, and a contributor to the Mexican dailies Reforma and El Norte.